(February 14, 2014)- Officers got more than they bargained for while checking out a suspicious vehicle. On Thursday, February 13, 2014, Cape Coral Police responded to a report of a suspicious vehicle that was occupied by two males and parked in a field near the intersection of NW 18th Avenue and NW 27th Terrace, Cape Coral. Officers responded and located the vehicle making contact with the two subjects inside the vehicle. Officers saw a meth-pipe laying in plain view on the passenger seat (where Lakin was seated) while speaking to the subjects and detained them while they began a narcotics investigation. Post-Miranda, Lakin admitted that the pipe belonged to him and that he used it to smoke methamphetamine. Officers searched the vehicle for additional narcotics and paraphernalia. Under the passenger (Lakin's) seat and in the floorboard behind it, officers located a "one pot" methamphetamine lab and numerous items used in the production of methamphetamine. Cape Coral Police Department Vice, Intelligence, and Narcotics (VIN) Detectives were notified and responded.Field tests were conducted on the meth oil that was in the mobile lab which yielded a positive result for methamphetamine and a total weight of 31.5 ounces. Evidence was collected at the scene. Lakin was arrested for manufacturing and trafficking in methamphetamine. He was transported to Cape Coral Police Department for processing then later to Lee County Jail. Investigation revealed that the other occupant of the vehicle had no involvement with the methamphetamine and was not charged. Due to the toxic and volatile nature of the chemicals that were found, a hazardous materials disposal team had to respond to safely dismantle and dispose of the lab. 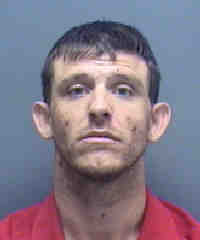 ARRESTED: Keith Mitchell Lakin, W/M, DOB: 07-05-1981, of 2814 NW 19th Avenue, Cape Coral,FL.